Mulbuie Primary School is a three-teacher school at the heart of the thriving rural Mulbuie settlement on the beautiful Black Isle. The School also hosts a Nursery for three and four year olds. Both School and Nursery foster a caring, personal approach ensuring pupils feel safe and secure while promoting their independence and resilience. Dedicated staff are committed to removing barriers to learning, ensuring equal access to education, health and wellbeing for all, while working in close partnership with an active Parent Council to forge strong links between school and home, and within the local community and beyond. 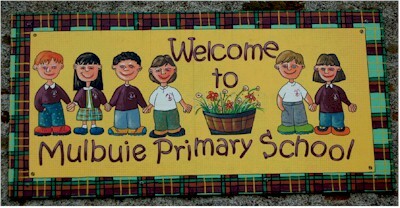 Opened in the late 19th century, Mulbuie Primary School has proudly educated local children for over 125 years and has its own unique ‘Golden Broom’ tartan, designed by pupils in 2006. There are currently 47 pupils on the school roll. Ferintosh Primary School provides its pupils with an interesting and stimulating environment which is supported by an ethos of encouraging achievement and celebrating success. The school provides a welcoming environment for both staff and pupils where we promote a sense of identity and pride in the school, showing equality and fairness. The school is viewed as being a truly community school and we endeavour to promote a firm two-way relationship between parents, the local community and also extending to the wider area of Ross and Cromarty. Currently there are 10 pupils in the school, one class P1-P7. There is 1 full time teacher. The school has a part-time Pupil Support Assistant, General Auxiliary and Clerical Officer.